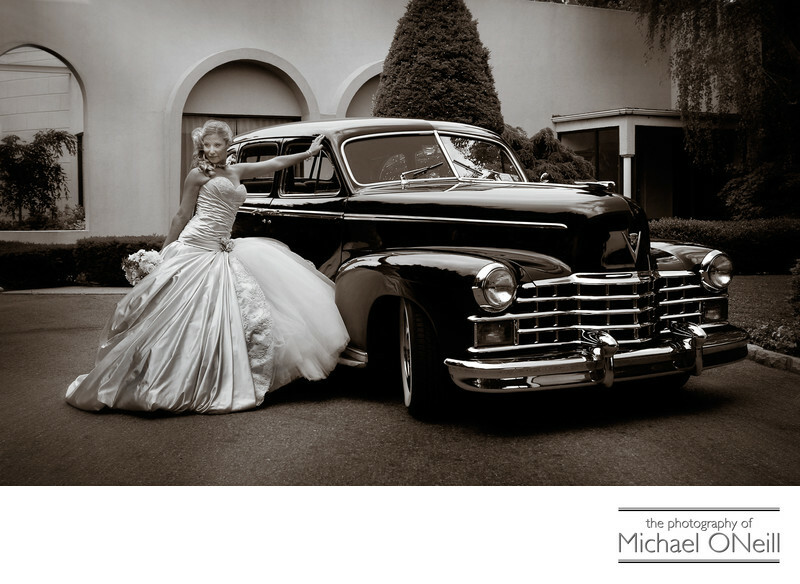 Everybody absolutely loves this wedding picture of this beautiful bride in an amazing dress posed alongside an awesome vintage Cadillac automobile. Vintage car photos need a vintage appearance so I treated this image to an old-fashioned sepia tone effect on the black and white image. The end result is stunning. This is yet another photograph taken at one of my favorite wedding venues, Marina Del Rey in The Bronx, NY. Located in the shadow of the Throg’s Neck Bridge, this waterfront establishment offers views of the Whitestone Bridge and the New York City NYC skyline beyond. We started this day with the bride and her bridesmaids taking fun pictures on the boardwalk at Coney Island, New York. We then hopped in the wedding limousines and headed up to Marina Del Rey where we met the groom and his ushers for the reveal and photos of the entire bridal party. The look on the groom’s face when he saw his bride in her wedding dress for the first time was priceless. After the outdoor wedding ceremony and cocktail hour at sunset all of the guests retired to the grand ballroom for a great night of dining and dancing.